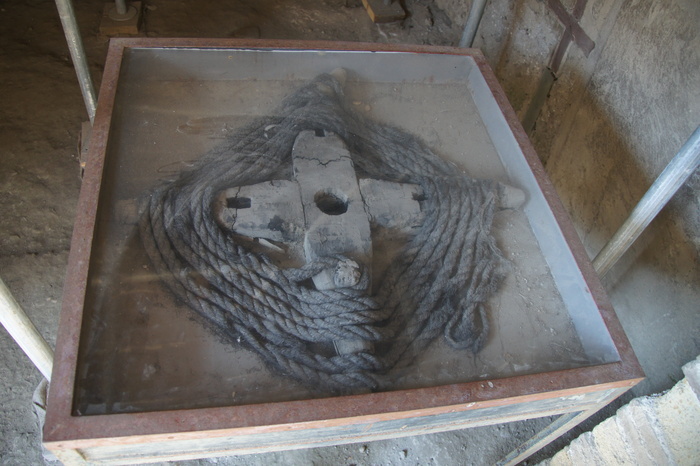 The House of the Opus Craticum (literally, house of reed and plaster walls) does not contain any reed and plaster walls (although this building technique was used in ancient Rome, it was not used in this house) but does contain this charred winch. Presumably there's a missing piece that went through the middle for the rope to wind around. 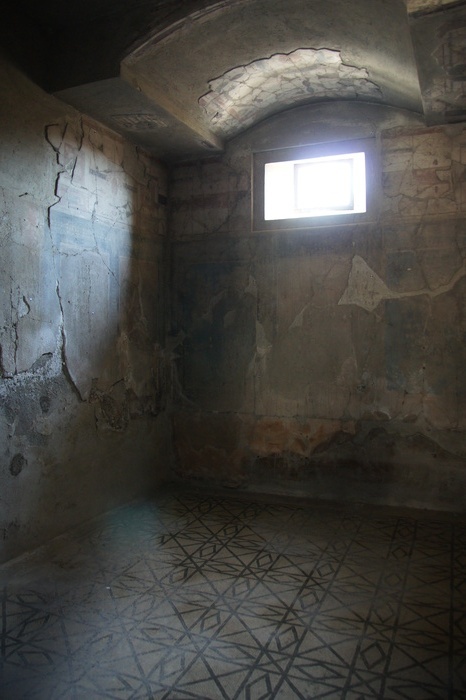 This house, like many in Herculaneum, was constructed by building a wooden frame and then filling the spaces between the wood with concrete and rock. 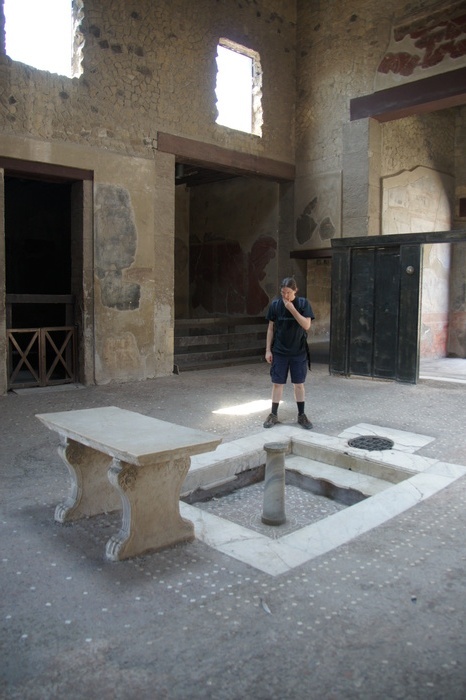 Eric inspects the inpulvium in the House of the Wooden Partition. The wooden partition itself is in the background. The partition was not the only wooden object preserved in this house. 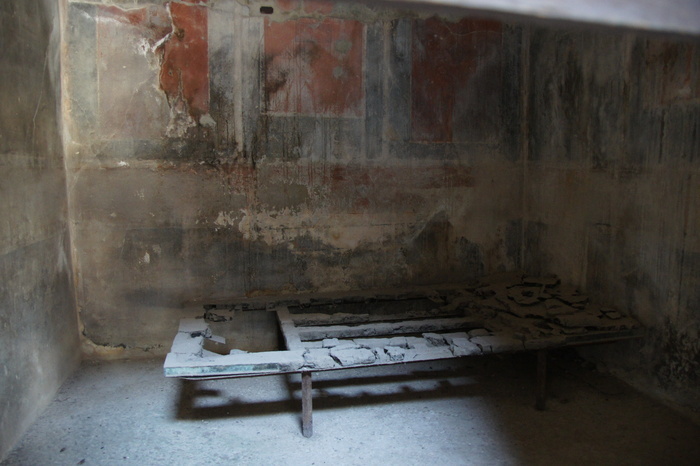 This bed was found here as well, and enough remains of the room's decoration that it is not hard to imagine what this bedroom must have looked like on the day the volcano buried it. The compluvium, the hole in the roof for collecting rain water into the impluvium. 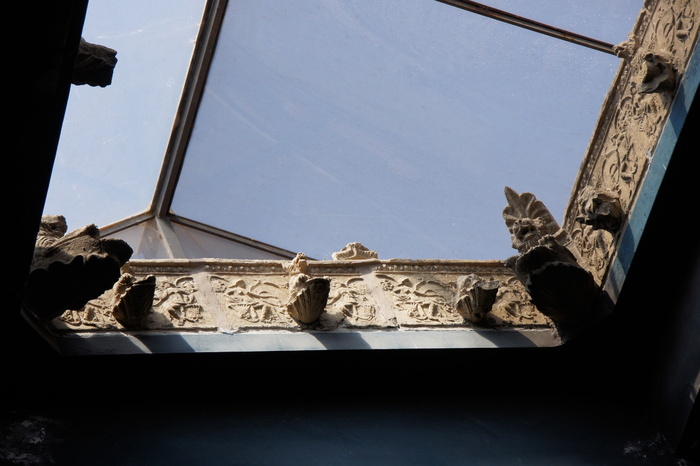 Glass has been added to protect it from wear, but in ancient times it would have been open to the air, also helping to cool the house. Another of the bedrooms in the house. Here you can see that every surface, including the ceiling, was decorated... often with paintings in painted frames, or painted to resemble architectural flourishes such as garlands, curtains, or pillars. We have seen this style before in Italy... in the Vatican. At the time we just thought it was odd. Now, it seems likely that the Vatican was intended specifically to evoke the style and tastes of the ancient Roman empire. 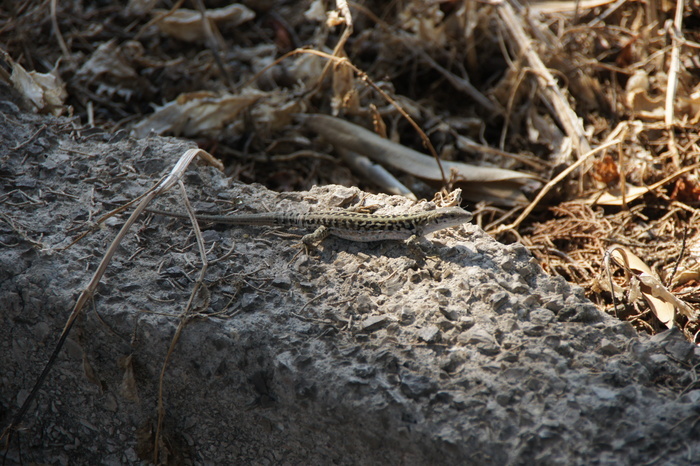 I did mention that Italy was having a heat wave? By mid-afternoon we were both exhausted from the heat, so we went back to modern civilization for a beer. This cafe demonstrates that there are multiple paths toward the goal of ice-cold beer. 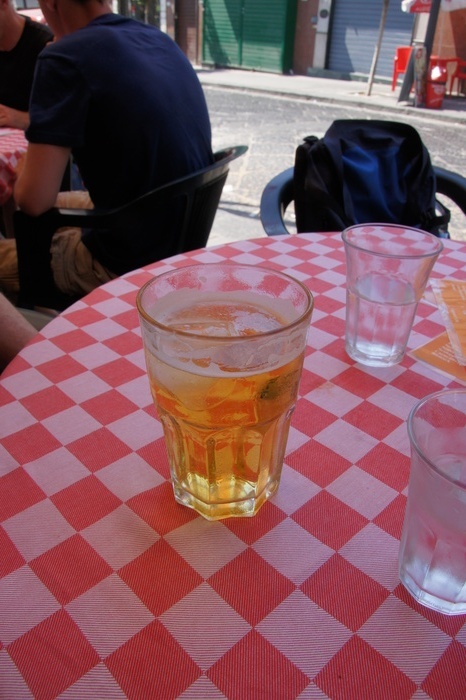 Since Italian beer tends to be rather thin anyway, it actually worked fine... and although many cafes had heavier beers, I noticed that I actually liked the local beer after a day in the local sun. 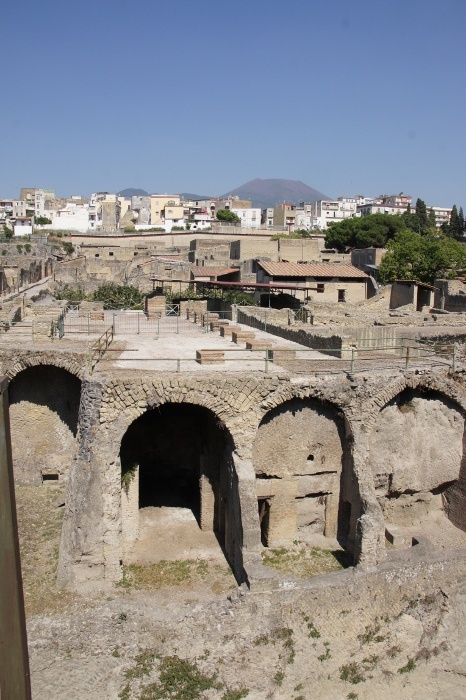 Meanwhile, back in ancient Herculaneum: In 79AD, this would have been the shore of the Bay of Naples, with boats docked in the U-shaped holes. 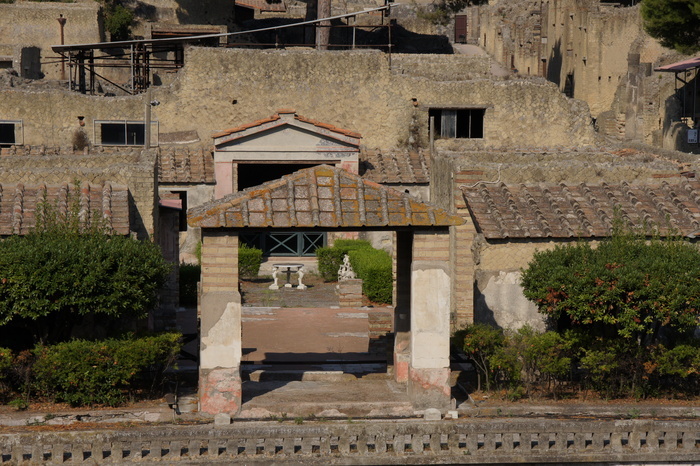 For many years, it was believed that the residents of Herculaneum had escaped, because nearly no remains were found in the city. Then, in 1980, they found the boat houses. They contained around 300 skeletons - people who had fled to shore, but were either waiting out the eruption or waiting for the arrival of a rescue boat when the pyroclastic surge hit the waterline, about 1:00 in the morning. The heat would have killed them instantly, and moments later the rock and ash would bury their bodies and push the shoreline out into the sea, eventually to about half a kilometer (around 5 blocks) away. Vesuvius looks on quietly from behind modern Ercolano. Eric looking onto the atrium of the House of the Corinthian Atrium. 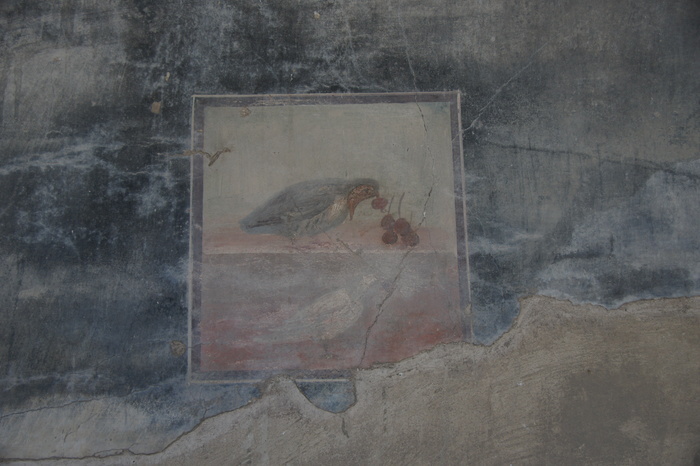 Fresco of a bird pecking at cherries in the House of the Beautiful Door. 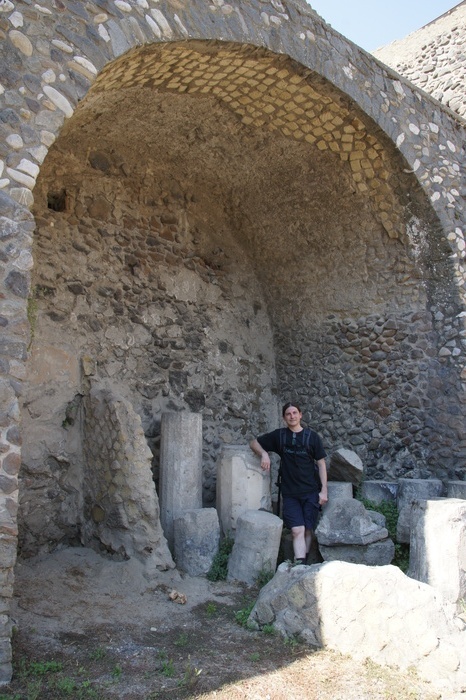 Eric hanging out in the collection of unclassified parts that always seem to be around Roman ruins. 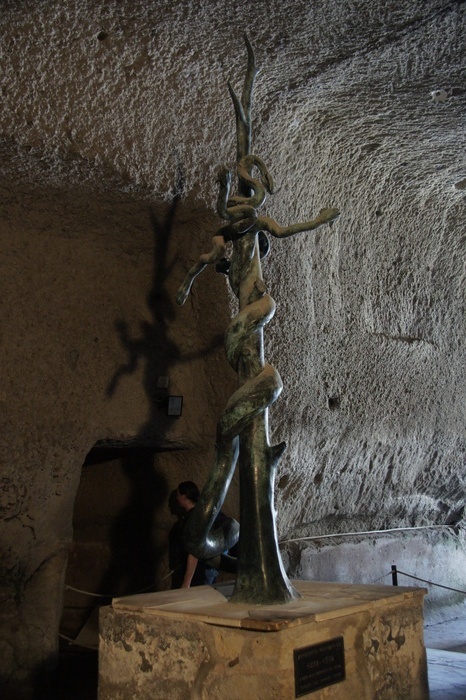 We stepped into a dark, cool alcove in the rock, happy to get out of the heat for a few moments. 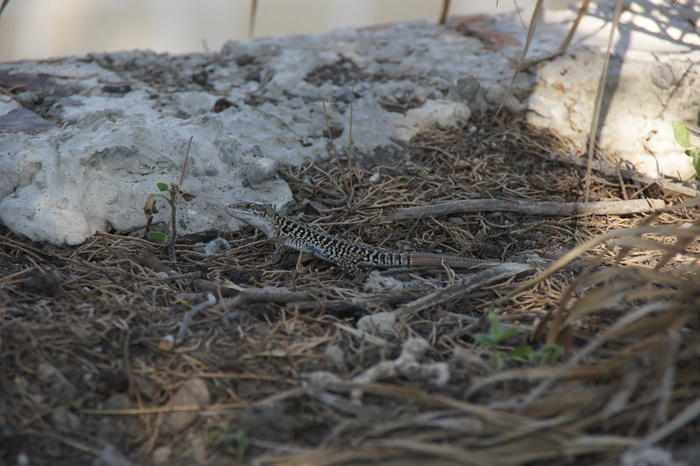 In the dim light we could barely make out the green-black shine of the bronze snakes. This fountain would have been on the edge of the Palestra, a large outdoor recreation area. In the center of the Palestra is a cross-shaped swimming pool, approximately a meter deep and 50m long. Another pool lies on its northern edge, although it is thought that this one may have been used for fish. 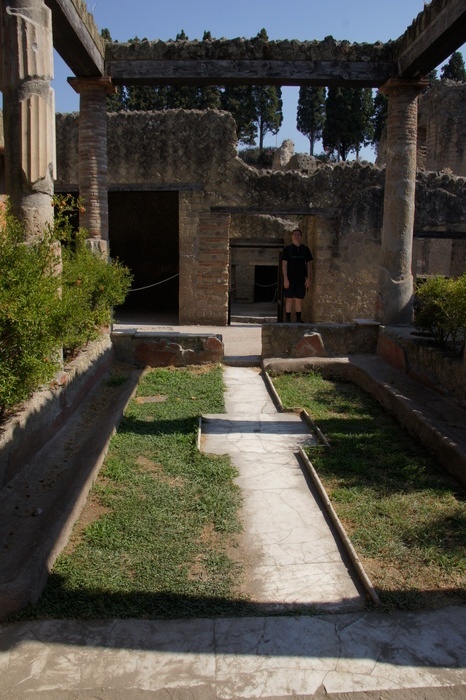 Such recreation areas were commonly associated with baths in ancient Rome. This one is mostly still buried - only the northern pool and some rooms near the entrance have been excavated. The House of the Deers was closed, but we could see into it from the walkway. This house had two statues of deer being attacked by hounds in the garden, and round marble tables. 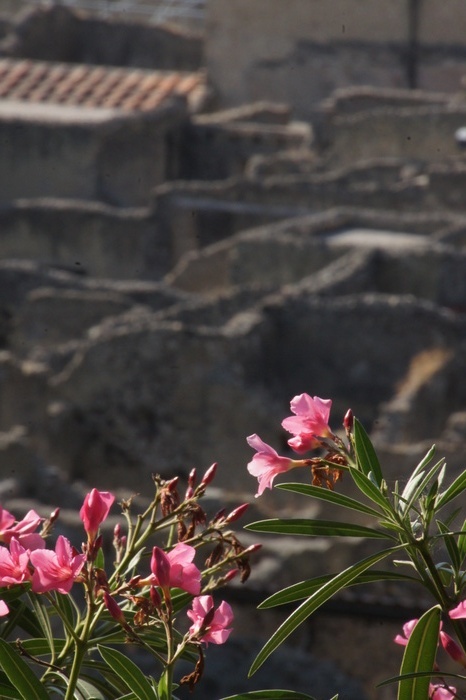 Finally, with the afternoon Mediterranian sun baking the bare stone of Herculaneum, we left the past behind.